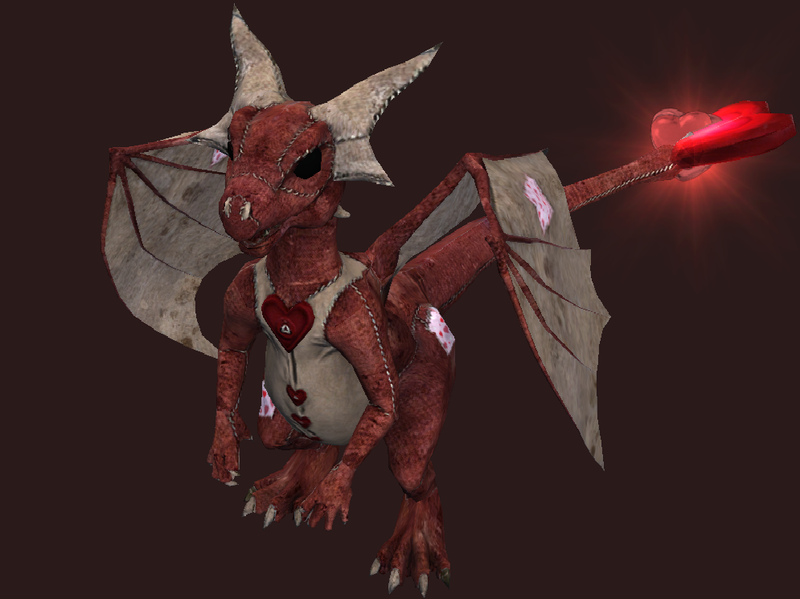 If it's Valentine's Day on Earth it must be Erollisi Day in Norrath. Call it a day? More like two weeks. The celebrations started yesterday and run until Tuesday the 19th. I never really thought of Erollisi Day as one of the big dates on the calendar but looking at the schedule it's really grown over the years. There are half a dozen one-off quests and almost a dozen repeatables, as well as a race, two collections and getting on for twenty achievements. When you consider that most of those can be done per character, not just per account, that's almost too much to cram into just under a fortnight. And that's not even considering the dozen recipe books of craftable items or the event currency you can farm to spend at a special vendor. There's a new collection this year, which I did right away, but the highlight of 2019's holiday is a new Public Quest. I love PQs. They're often chaotic and I generally have no idea what I'm doing. I just follow everyone else, attack anything that's aggro, click on anything that's not and have a rare old time. My team on the right, waiting for the slowcoaches coming down the hill to meet us. All those colored lights are flowers. The new PQ is called "Love Will Lead You Back". It's beautifully designed; easy to understand, simple to run, fun to do and thematically appropriate. The idea is to re-unite two lovers, separated by death. Literally. One's a zombie, the other a skeleton. I think. It was hard to see with all the mounts, mercs and familiars milling about. The two lost souls begin on opposite sides of the zone and you have to guide them towards a re-union in the middle. To do this you pick various colored flowers as they spawn. The yellow and red ones urge the lover on (his or her outline glows the color of the one you're supposed to hand over) while the purple and black ones spawn aggressive undead out to spoil love's union. The first time I ran the PQ (I've only done it twice so far) I followed my regular method outlined above and attacked/clicked on anything I could see. This turned out to be a sound strategy. When our group came in range of the other coming towards us, the two lovers sprinted into each others' decaying embrace, together for eternity. Mount training is a big deal these days. So they tell me. As well as a warm glow (someone did actually say "Awww, that's so sweet!" in chat) I got eight Erollisi coins, a five-day Mount Training accelerator token and a Heart Shaped Egg. I examined the egg. It seemed to be a Familiar but there was no obvious way to hatch it. I would have looked it up but at the time no-one had written the new PQ up in detail. Fortunately the Test chat channel, which I have been in since the game began, even though I haven't played on Test regularly for nearly ten years, was buzzing with people talking about the new content. I learned that this PQ has a couple of clever mechanics. Firstly, as is often the case with Public Quests, your participation is graded. This time, however, you can be rated Passive, Active or ProActive. For "Passive" you just have to be there. It's a reward for bothering to turn up. "Active" means hitting stuff when it spawns and registering sufficient damage. Probably. No-one seemed entirely sure. ProActive, the one you want, means not only hitting the mobs but also handing the flowers to the lover and, crucially, clearing the black and purple flowers before they have a chance to spawn baddies. To hatch your egg you need to be graded "ProActive" a number of times. No-one seems quite sure exactly how many - there's probably a random factor - but the consensus is somewhere between six and ten. Most of this is subject to revision as more information comes in. I can see that this is going to annoy some people but I think it's rather clever. 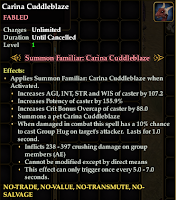 The familiar, a patchwork baby dragon named Carina Cuddleblaze, is exceptionally cute. It also has decent stats. Quite a few people are going to want that egg to hatch and some are going to want it on more than one character. I can see the PQ staying busy for the whole of the holiday. Less welcome is the cadence for the Public Quests themselves. Yet again, facts are hard to come by, but it seems the PQ happens about once an hour, alternating between The Commonlands and Antonica. It takes about five or ten minutes and there's no global or even zone-wide broadcast. This is not ideal. I spent a lot of time just sitting around waiting for the Antonica one to start last night and it never did. It would, however, have been easy for me to have missed it because I kept tabbing out to look at stuff on the web. In the time I was waiting, I also missed one in The Commonlands, which by my reckoning shouldn't have been up at all. It would be nice either to have these things on a known, set schedule or for there to be a global Broadcast. The PQ is tons of fun but waiting for it, not so much. Anyway, that's a very minor complaint. Once again EQ2's small but dedicated development team has done us proud. I will be making every effort to hatch my egg so that Carina can join me on me travels. Everyone needs a patchwork baby dragon with Group Hug! Wow, I soo need that plushie, it looks adorable. Looks like I'll be back in Norrath this week! I hatched it last night. It took me either six or seven runs. I've heard a sfew as five and as many as ten. Some of the "facts" in the post are inaccurate, as I have discovered from experience. The PQ is only in Commonlands, not Antonica. It does have a fixed schedule but there is a random factor - it's one hour after the end of the rpevious one, so it varies by how long people took to finish each time. Also, there *is* a broadcast message but it only appears in chat, not in the heads-up UI. Good luck - the lil' chap looks fantastic when you get him! Got proactive on the first time I ran it. 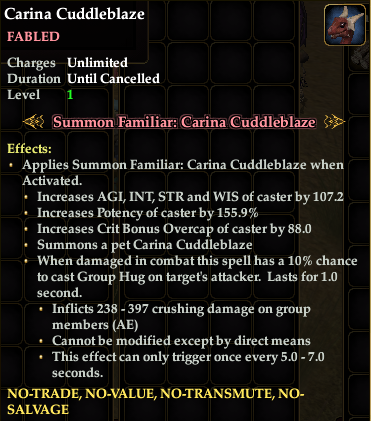 Good to know it's only Commonlands as that'll save a lot of hoping between zones. Detail does seem scarce, so the clarifications in this post/comment are much appreciated!